We truly love working with first-time homebuyers here in Nashville — it thrills us to help any buyer find their dream home, but there’s something special about crossing that finish line the first time, and being able to proudly hold up that front-door key as a new homeowner. It’s an exciting moment, but we also know it can be an overwhelming and intimidating process. So our role and our work is, from where we stand, especially important with first-time buyers. We’re helping people navigate an unfamiliar terrain, confidently, so they can reach a dream. So given all that, we were happy to see the news that after years of slipping, first-time buyers are on the rise again nationwide. According to the 2016 Profile of Home Buyers and Sellers released late last year by the National Association of Realtors, the percentage of home sales to first-time buyers hit 35 percent in 2016. That’s the highest percentage since 2013. A lot of different factors are feeding into why first-time homebuyers are seemingly feeling more encouraged, and any number of different experts can and do point to specifics, some national, some local, some positive, some not-so-positive. Mortgage rates being at historic lows had a mix of effects — a lot of refinancing, some buyers finding that they could up their budget a little, many buyers finding homeownership more possible than it seemed a few years ago. But it’s not surprising to see things changing as rates creep up again. Trends being what they are now, many buyers are feeling like time’s wasting, and the longer they wait to buy, the harder it’ll be. Here’s why: As of this posting, the average interest rate on a 30-year, fixed-rate mortgage loan was at 4.25 percent; about a year ago, it was hovering under 3.7 percent. Just as an example, a $250,000 mortgage with that lower rate would run you $1,148 a month. With the higher rate, $1,230. Fractions of a percent can make a difference when your budget’s tight. That seems to be influencing a strike-now mindset across most buyers, but first-time buyers especially. The normal trend is for asking prices to drop in the fall. This past fall, though, according to Realtor data, the nationwide median price was the same in December as it was over the summer: $250,000. That was a record high, and an almost 10 percent increase from the previous year. If you’re looking to buy a home in Nashville, you’ve seen this — prices have been steadily rising, by and large, for a while now. This has a similar strike-now effect with buyers who see the distinct possibility of affordability only getting tighter as months pass. 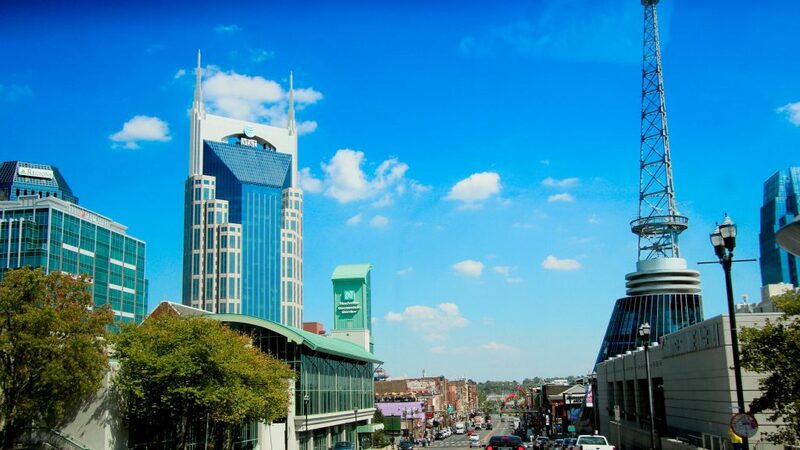 Here’s good news: While Nashville isn’t on an affordability upswing right now, it’s far from the worst place in the U.S. for first-time buyers. Bankrate pulled together a rundown of the toughest places to become a homeowner, and many were probably obvious (California, New York, Hawaii), others a little surprising (our Southern neighbors in Mississippi and Louisiana). We didn’t rank in the list, which is good. Tennessee is still a comparatively approachable place for first-time buyers, and since Nashville has a lot of other good things going for it — low unemployment, leading job-growth across a number of industries, an inspiring entrepreneurial climate and lots more — we (and lots of others) see it as a pretty fantastic place to buy and live. In many growing cities, including Nashville, first-time buyers are struggling with unique challenges — as prices rise here, those with modest down-payments and budgets can have an uphill battle finding affordably priced properties, and getting an offer accepted once they find one. The effect, here, is that buyers feel rushed, and the market gets/remains somewhat frenzied. Experienced Realtors are valuable allies here; we can help you on a lot of fronts, from finding pre-market properties to keeping you from getting overwhelmed when offers are moving. This is a good thing. Tackling the inventory issue should help first-time homebuyers, and we’re moving in the right direction, nationwide and in Nashville. Builders across the board started the most new homes since 2007 last year. 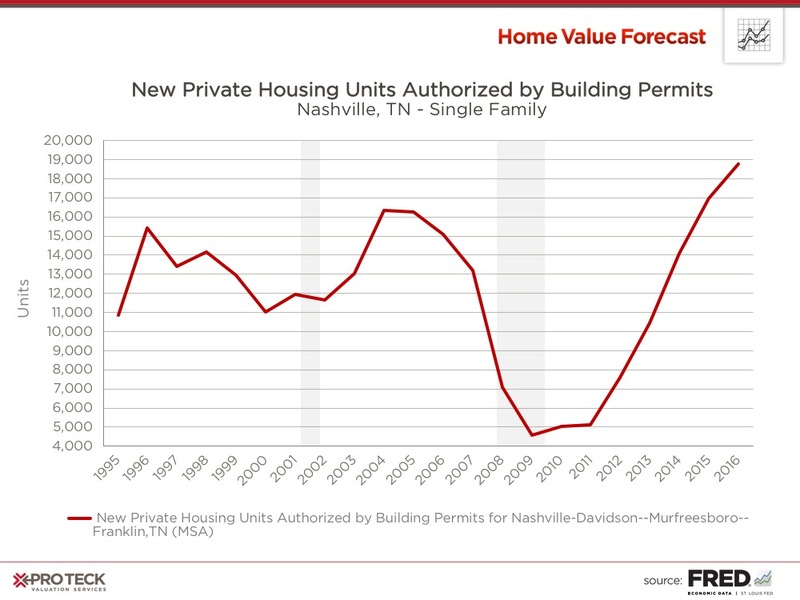 Specifically in Nashville, you can see in the chart above (from Pro Teck Valuation Services’ Home Value Forecast) that building permits for new housing units have been on a steady and steep upswing. A previous slowdown had left us with a huge inventory shortage that we’re still feeling the effects of, so this is welcome. This one will feel especially positive here. The Tennessee Housing Development Agency is helping first-time buyers over a hurdle, and giving a boost to zip codes that were the hardest hit in the economic downturn. Through the Hardest Hit Fund Down Payment Assistance (HHF-DPA) program, qualified buyers can get $15,000 toward a downpayment and closing costs on an existing home in participating zip codes — here in Nashville, it’s 37218, 37207, 37208, 37115, 37217 and 37086. That out-of-pocket cash can often be the toughest part of making homeownership a possibility, so this program can make a huge difference. Read more about the HHF Down Payment Assistance Program here. Going forward, we think it’ll encourage more first-time buyers to make their dream a reality. The importance of affordable housing — for first-time homebuyers and renters alike — isn’t lost on Nashville Mayor Megan Barry, and that’s another good thing. It’s among her big priorities, and action plans toward funding, building, preserving and retaining affordable housing options are going and growing. There’s been some growth in developers building properties with first-time buyers/affordable housing in mind. One of our favorites happens to be one we’re listing: Ashland Place in northwest Nashville. 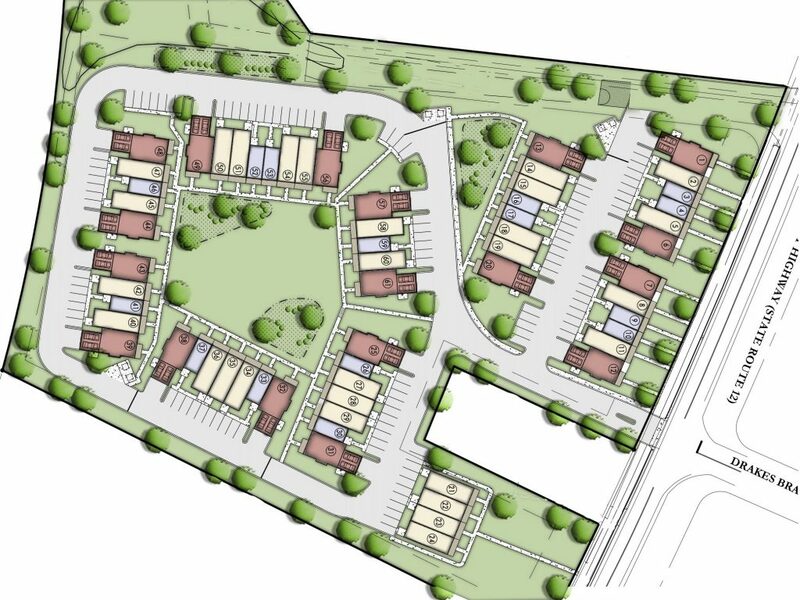 It’s a townhome community with 61 units, all with smart layouts and luxury finishes, all at price points that’ll be approachable for first-time buyers and downsizing couples. Learn about Ashland Place here, and let us know if we can give you some more details, or show you around. We know this is a lot to think about, and if you’re considering buying your first home in Nashville, you already have a lot to think about. We’re more than happy to talk and walk you through this process, from helping you figure out a workable budget to exploring Nashville neighborhoods that might be a good fit for you and your family. 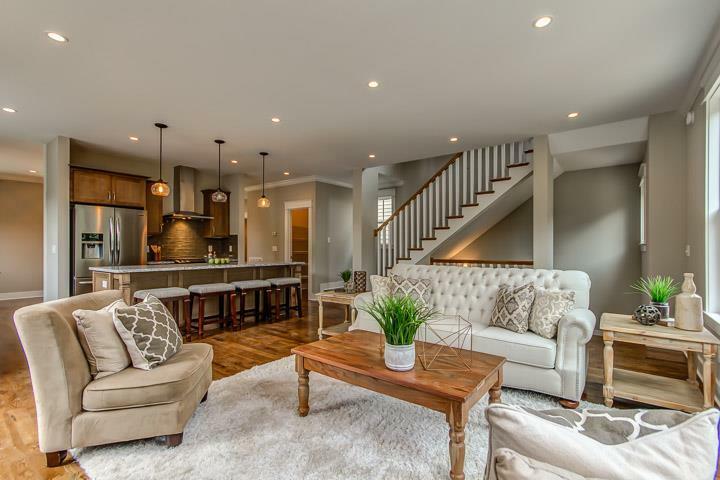 Here’s an easy way to get started on your Nashville house hunt. And if you have any questions, we’re always happy to chat. Just call or email ACRE.